This image is comprised of three video fields where the brightest pixels are used (Adobe "Lighten") to somewhat enhance the event. Each video field was adjusted in brightness by decreasing the max Level from 255 to 174. 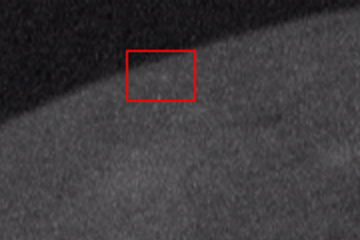 This impact event was too dim to be detected using LunarScan and was found visually only after being alerted to it by Ron Suggs at MSFC who was seeking confirmation. Their remote telescope was under cloudy weather and thus unavailable for a remote confirmation. What luck! Meteor Environment Office at Marshall Space Flight Center (MSFC).